Deceivers are the primary aggressors against humanity itself. All land outside of the city walls is their domain, making the roads dangerous during the day, and a deathwish after dark. These monsters are easily identified by a bone mask which conceals their repulsive humanoid visage. Despite their abilities paling in comparison to those of the Akuma, Deceivers are nearly old as Solum itself. Back when Solum was young it longed to make children such as the Akuma. However, it’s original attempts failed, resulting in grotesquely mutated abominations formed of both animal and man. Countless botched attempts produced a endless variety of monsters, but as they were its children Solum could not vanquish the creatures. 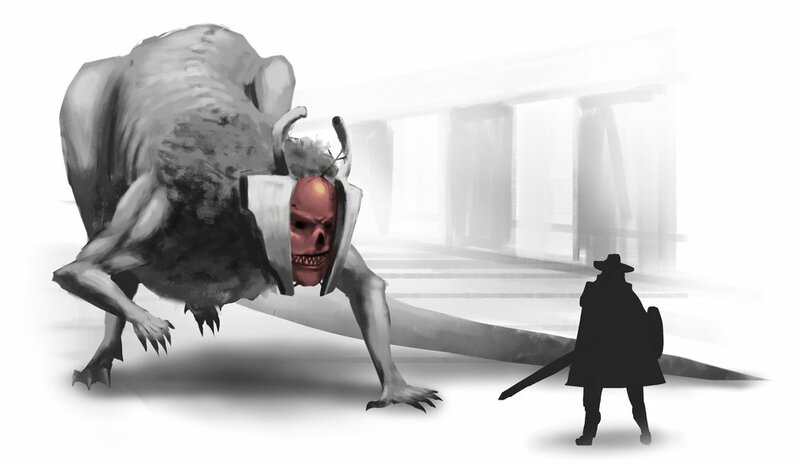 Instead, the Great Walker pitied the creatures by granting them masks with which to hide their disgusting appearances. During the countless centuries before man arrived the Deceivers would grow, mutate, evolve, and adapt to the land. Hundreds of unique Deceivers have now been identified covering the broadest possible spectrum, and yet their masks remain as a token of Solum's pity. In terms of shape, size, and behavior these supernatural beasts have appeared to find a niche in every part of the ecosystem.